Please note: The coursework, GPA, and degree requirements are the minimum requirements for entry into the MS-CN program. 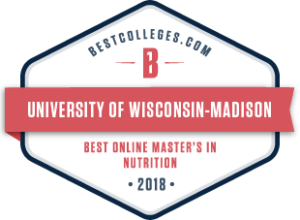 The Masters of Science in Clinical Nutrition has a rolling admissions policy with priority deadlines. Applications received after their priority deadlines will be considered until ~6 weeks prior to the beginning of the intended semester. Review of applications for admissions are reviewed immediately after respective deadlines, applicants can usually expect to be notified a month after deadlines. Fall semester: February 15th priority, rolling admissions until July 15th. Applications received after their respective deadlines will be considered as space permits. Review of applications for admissions are reviewed immediately after respective deadlines, applicants can usually expect to be notified a month after deadlines. If you are admitted after the priority deadline, we cannot guarantee availability of all offered coursework of the following semester. 1. Complete a UW-Madison Graduate School Electronic Application. a. Reasons for Graduate Study. Please include a brief statement about your professional goals, and reasons for applying. b. Letters of Recommendation. Three letters of recommendation are required. All letters of recommendation are submitted electronically through the admission application. c. TOEFL scores, if necessary. d. Unofficial transcript, submitted electronically. 2. Be sure to closely follow the “Steps to Apply” section of the Graduate School Admissions page and watch your application status page through MyUW for missing checklist items or additional information. For any questions or if you need additional information please go over the Graduate Admissions FAQ, or e-mail the Graduate Program Coordinator: Katie Butzen at kbutzen@wisc.edu.